Please send me a price for the NPP4343-NS-BulkBagPal new 43x43 plastic pallet. The NPP4343-NS-BulkBagPal is a specialty Plastic Bulk Bag Pallet designed to solve problems in specific applications. 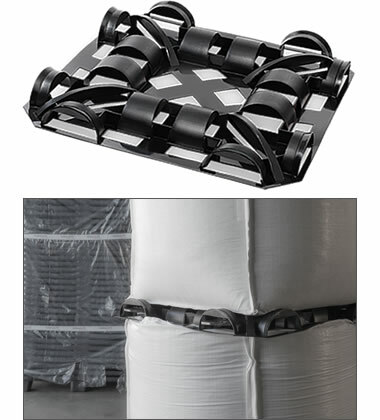 The unique tunnel-based design of the NPP4343-NS-BulkBagPal plastic pallet helps to prevent forklift tears in bulk bags. The low profile nesting design of the NPP4343-NS-BulkBagPal plastic pallet saves space when empty for lower storage return transport costs. This stackable plastic pallet has a strong 4 tunnel bottom deck for safe double stacking of multiple plastic pallets with product. Plastic pallets like the NPP4343-NS-BulkBagPal are lightweight and durable. Its uniform length and width provide ease of use and safety. A lower cost plastic pallet like the NPP4343-NS-BulkBagPal lets you ship it out and erase the fiscal worry that comes with pallets not coming back. One-way plastic pallets like the NPP4343-NS-BulkBagPal let you send it and forget it making this a competitive alternative to pallet return options. Get more turns using the NPP4343-NS-BulkBagPal multi-trip plastic pallet and easily win back startup costs with durable and reliable plastic. Use the NPP4343-NS-BulkBagPal captive plastic pallet in closed loops to satisfy in-house reusability requirements with the reliability of plastic. Save costs when shipping cargo via air with the NPP4343-NS-BulkBagPal air freight plastic pallet. Perfect for single use and one-way air shipment. One-of-a-kind pallet design serves as a unit base and a divider for block stacking. Special tunnel design protects big bags from forklift tines damage. Nesting height is just 2.5" for space-saving storage. Is the NPP4343-NS-BulkBagPal the right pallet for you?